*I was given product in exchange for a blog post. The opinions and project are my own. 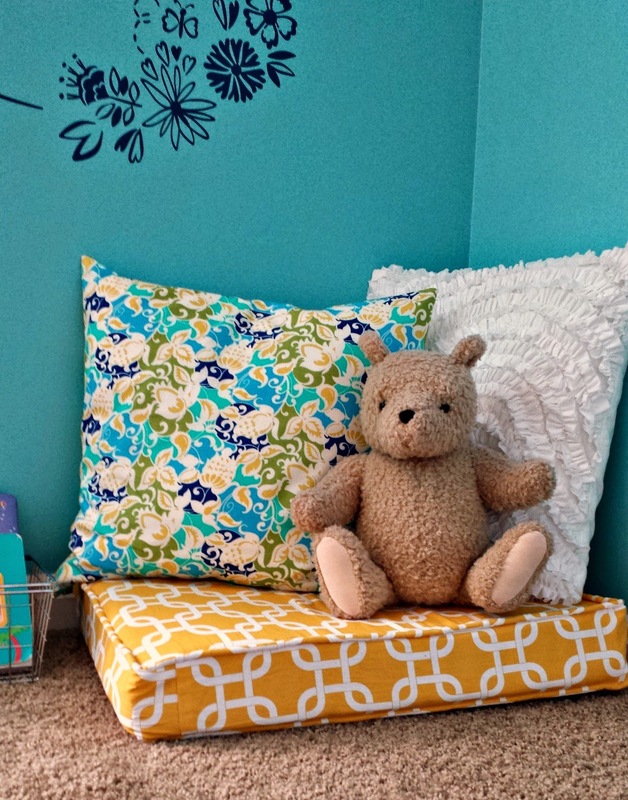 My older daughter has had at least 3 bedroom makeovers- the rest of my children have had 0. I've decided it's time to do something about that. So, instead of starting with the next oldest child (who is a boy and just wants posters of sports heroes and cars on his walls) I started with the youngest. She's not yet 2 and doesn't have very many opinions of her own so I can do what I want. 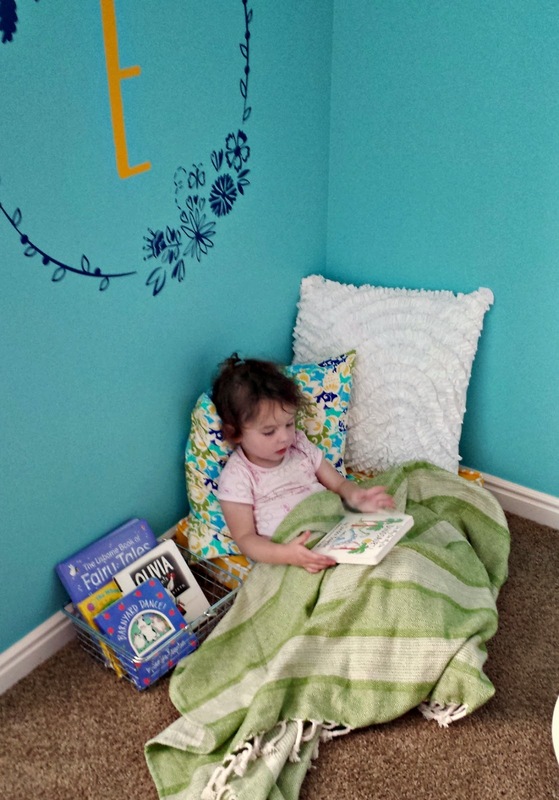 When I was given the opportunity to review these Wallternative decals, I knew exactly what I would use it for, a reading/play nook in her bedroom. She is a big fan of pillows and soft things, so I knew she would love a little area just loaded with things to snuggle up with. I decided to set off the area with this beautiful Wildflowers Floral Frame. Isn't the detail gorgeous? I chose to get it in Dark Blue and I love how it looks against the turquoise paint. Then, I had to add yellow, it's just so bright and fun. 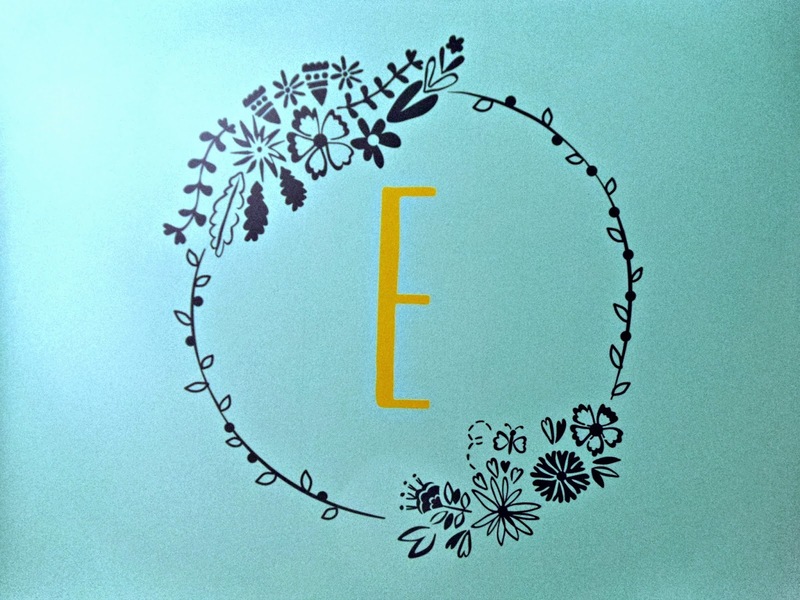 The font for the letter monogram is Tall and Thin. 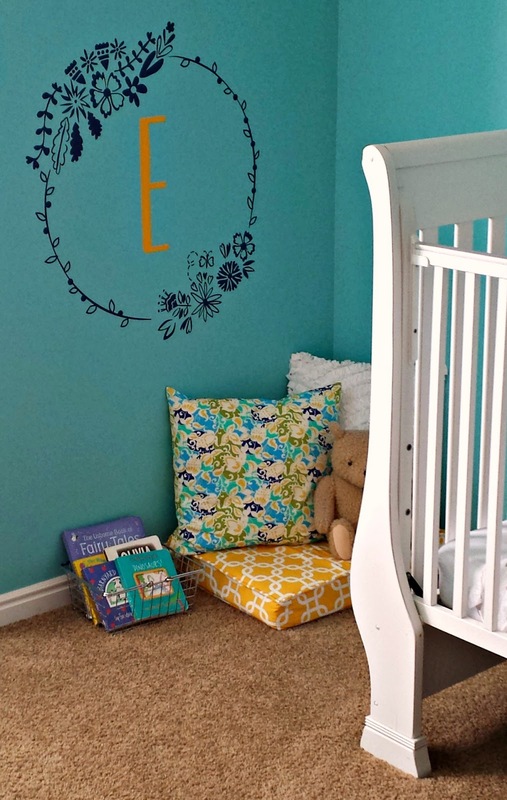 You can see how the nook fits neatly in the corner behind the crib. I love that it creates a cozy place she can play in. The Designer Decal from Wallternatives was easy to apply. Just be sure you follow the directions, including making sure the burnish the decal before pulling off the backing and taking plenty of time to SLOWLY pull off the transfer tape. There are a TON of details in this gorgeous design and you want to make sure you don't miss a bit of it. And the reading nook as a whole? I'd say it is a success. 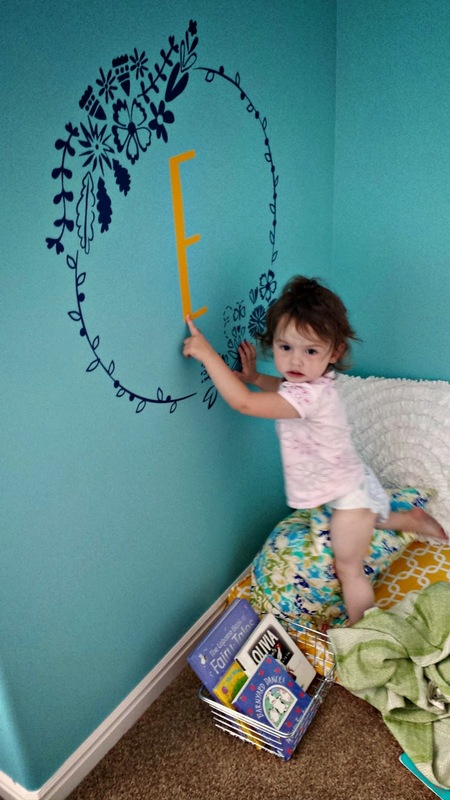 And, No, she doesn't read yet. She just loves to flip through the pages of her books. I'm hoping it's a good sign though that she will take up reading just like her older siblings. 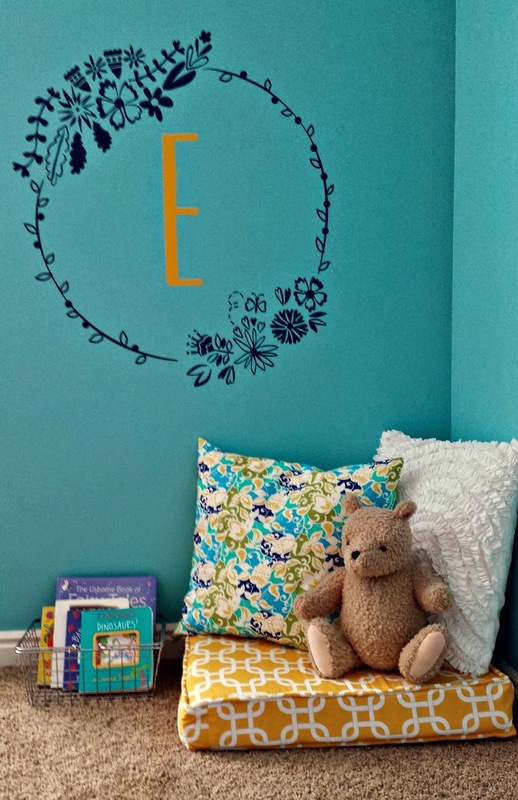 Would I recommend Designer Decals from Wallternatives? Absolutely. Even going slowly removing the transfer tape, it was still many, many times faster than stenciling or hand painting this intricate design. It accomplished just what I hoped it would, stunning design, simply done. Do you have any makeover projects on your list this summer? I'd love to hear what you're up to. This turned out so amazing. I love the colors. She is a lucky little girl!